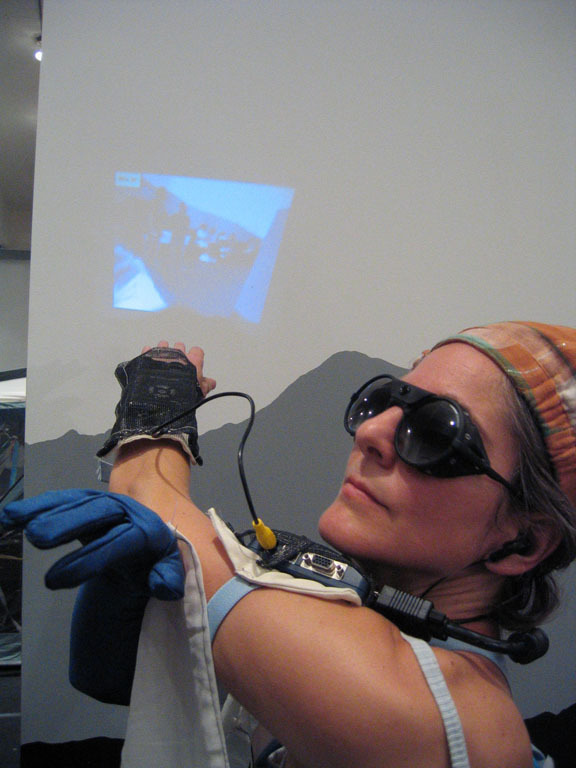 Cyborg Nation is built around a Self-Contained Performance Environment (or SCoPE); miniature technologies built into a costume that acts as a portable media center, used to create performance installations in any venue. Technology and performance become aids to philosophical inquiry and investigating intimacy in a world of remote communication. This manifests as a participatory performance experiment where one-to-one conversation is a public display—intimacy becomes spectacle and strangers find depth in momentary contact. The “performer” becomes an opinionated conduit for physically present and remote audiences, fielding phone calls and images from the participants in the room and elsewhere, with live feed and pre-recorded visual and sound elements woven in. When performed, an installation will be set up using materials that fit the atmosphere of the venue. The SCoPE minimizes energy consumption to create a model of sustainable (art) production that doesn’t sacrifice the spectacular. Cyborg Nation Excerpts from Clarinda Mac Low on Vimeo. The SCoPE is deliberately un-slick–a nexus for fantasy and imagination rather than an attempt at mechanized perfection. Basically, there’s a lot of creative lying that goes on, as the person wearing the SCoPE imbues it with impossible superpowers and weaves a net of fantasy and humor to bring people gently into a new thought process about basic existential questions. Cyborg Nation grows from an urgent interest in how technology both extends and limits our senses, becoming a replacement of spiritual and actual missing limbs. Added to this is a desire to shift what we think we need to survive. These concerns take concrete form as an experiment with audience/performer interaction that engages intimate one-to-one conversation as a public display. We are all cyborgs now (cf. Donna Haraway, ca. 1980s). Electronics are integral to how we love, communicate, and interact. What is the relationship between our fleshly and technological selves? We live in an era of depleted resources and looming climatic disaster. There are thinkers that advocate living as though on a boat; miniaturizing and cutting down—nomad values in rapidly changing terrain. Technology has become smaller and more self-contained, but more ubiquitous. Can we turn this to our advantage without further destroying the integrity of our overstressed environment? I want to create a performance that serves as a template for a way of life that embraces adaptability and conservation of physical and emotional resources. This piece is also an investigation of conversation as a forum for examining culture and as a mode of influence. The more regulated our lives become, the more I see a need for spontaneous, unscripted interaction. I see this piece as addressing a need for the tangible in a culture increasingly dominated by surfaces, I have found in other pieces, such as Salvage/Salvation, that informal discussion can act as an agent of change and illumination. I see the vulnerability of being open to the moment and engaged with an unpredictable audience as a small revolutionary act. Also, I believe that deep philosophical investigation begins in discussion, and Cyborg Nation aims to be a 21st century version of a Socratic dialogue.